The Celebration of Life service for Elaine is postponed until Friday, May 17, 2019 at 1:00 p.m.
Celebration of Life Services for Elaine Espelien of Starbuck, MN will be held Friday, May 17, 2019 at 1:00 p.m. at Fron Lutheran Church in Starbuck, MN, with Reverend Paul Johnson officiating. Visitation will be one hour prior to services at the church on Friday. Burial will be in Fron Lutheran Cemetery, rural Starbuck. Elaine Clarice Espelien, the daughter of Alfred and Severene (Mallum) Thorson was born on July 6, 1927 in Rolling Forks Township, Pope County, Minnesota. She was baptized and confirmed at East Zion Lutheran Church in rural Starbuck. Elaine grew up in Rolling Forks and Langhei Township and attended country school in District 62. She was united in marriage on February 12, 1949 to Clarence Espelien at the East and West Zion Lutheran Parsonage by Reverend K.R. Palmer. They farmed in Blue Mound Township until August of 1958 when they moved into Starbuck. 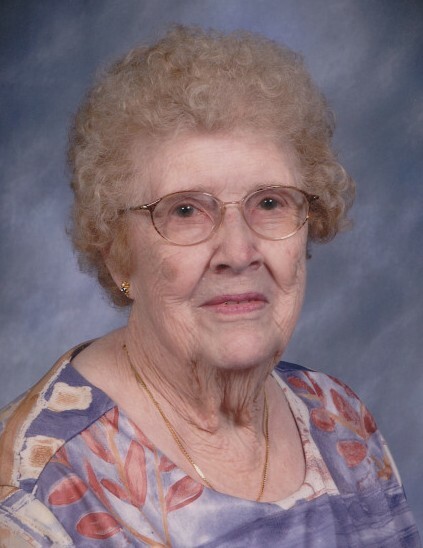 Elaine was a member of Fron Lutheran Church in Starbuck where she was active in the Ladie’s Aide. She was also a volunteer at the Minnewaska Lutheran Home for many years. Elaine enjoyed playing Bingo and Yahtzee and visiting friends and relatives. Elaine died on Thursday, January 24, 2019 at the Glenwood Retirement Village in Glenwood, she was 91 years old. Elaine is survived by her daughters: Sandra (Wayne) Block of Big Lake and Carol (Dale) Erdman of Excelsior; four grandchildren: Brandt (Chris) Block, Jennifer (Jeff) Peterson, Jeanna Erdman and Joseph Erdman; two great-grandchildren: Jacob and Jillian Peterson and many nieces and nephews. She is preceded in death by her husband, Clarence; her parents; two brothers: Kermit and Marvin; one sister, Alverna “Verny” Schumacher; and brothers-in-law and sisters-in-law. Starbuck Funeral Home in Starbuck is in charge of arrangements for Elaine. There's still time to send flowers to the Visitation at the Fron Lutheran Church from 12:00 PM to 1:00 PM on May 17, 2019.